I'm not opposed to spending more money on fixing up roads and bridges and other physical infrastructure--indeed, it's often an investment fully justified by cost-benefit analysis--but I am dubious that 21st century economic growth is going to be based on fewer potholes. When talking about investment to drive economic growth, I'd like to see more focus on expansion of research and development spending. The OECD recently updated its data on "Main Science and Technology Indicators," and here's a figure generated from that website comparing R&D spending as a share of GDP in different places. The three countries for which there is data going back to 1981 are Germany (the purple line DEU), the United States (the olive-green line), and Japan (the red line). Notice that despite all the talk about how knowledge gains will be exceptionally important in the decades to come, US R&D spending as a share of GDP has barely budged in the last 35 years. Of course, one can also point out that Germany's R&D as a share of GDP has barely budged either. 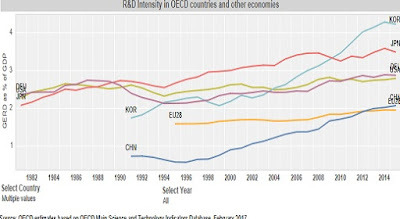 And both the US and Germany have higher R&D spending, relative to GDP, than does the average for the 28 countries in the European Union (EU28, the yellow line). On the other hand, R&D spending in Japan is higher than US levels. R&D spending in Korea (light blue line) has soared far above US levels. R&D spending in China (dark blue line) has risen to surpass EU28 levels and is moving closer to US and German levels. Research and development efforts have spillovers that offer broader benefits across the economy. As I've noted before, there are economic studies which suggest that optimal US R&D spending should be double or even quadrupled from its current levels. I'd be happy to start with a smaller increase: say, taking steps to raise R&D spending by 1 percentage point of GDP in the next 5-10 years. 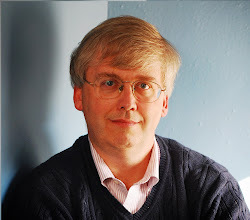 For other posts on this issue, see "US R&D in (Troubling) Context" (February 25, 2015).